The Hike is on the Cabeza Prieta National Wildlife Refuge and to enter you must obtain a current permit from the refuge office at 1611 N. Second St Ajo Az. The permit is free and the office is open during business hours Monday though Friday but closed from 12:00 to 1:30PM. Come prepared with at least a liter of water, plenty of sunscreen, a hiking pole if you wish, and a snack. Plan to carpool from the Visitors Center. Due to a seasonal closure during the endangered Sonoran Pronghorn fawning season the hike area may be unavailable during the late spring and early summer. Check the dates of closure when obtaining permits. This walk is along an existing road to a mine that provided minerals to the smelter in Ajo. The distance is about 3 miles round trip and climbs 100 ft up a typical Bajada environment. From the Refuge parking lot it is 9.1 miles (14.6 km) to the parking area and 3.9 miles (6.4 km) off the Ajo Loop Road. Park at the Refuge boundary at 32º18.83N and 112º55.92W and hike WSW along the road. The first half-mile affords a nice selection of Arizona upland and Lower Colorado Flora including the usual varieties of trees such as Palo Verde, Ironwood and groups of similar aged Saguaros. Many other desert regulars can be seen along the road, Englmmann’s Prickly Pear, Chain-fruit Cholla, Ocotillo, and Hedgehog cactus among them. Keep an eye open for Packrat nests at the base of shrubs which can be found near the road. These are easily located by searching for an accumulation of cholla buds which the animal uses to build its nest. At about .75 mile you should notice a south facing hill on your right with an impressive population of Organ Pipe cactus. The protection and orientation afforded by the hillside and wash below create a micro-climate appropriate for a plant more accustomed to the warmer regions to the south in northern Mexico. The road then enters a wash for the final part of the hike to the mine. Here you will notice many tracks and trails of animals frequenting the sandy bottom of the wash.
San Antonio Mine is a former silica flux, feldspar, and scrap mica surface mining operation located near 32º18.420’N, 112º57.087’W at elevation 1930 ft, and 11 road miles (17.5 km) SW of Ajo on the Cabeza Prieta National Wildlife Refuge. It has been worked since about 1946 from a small pit. 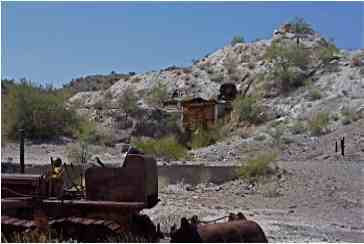 Owned at times, or in part, by the Pumice Corp. of Arizona, Ballestreras, and the San Antonio Mine Co. The mineralization is irregular pegmatite dikes and masses in Mesozoic granitic intrusive rocks. Uranium minerals exist as coatings on fractures in the pegmatite and granite. The workings are open pits with the overall workings just over 15 meters long and about 5 meters wide. Small lots of scrap mica and feldspar were recovered. Several tens of thousand tons of silica flux were shipped to Ajo’s smelter. 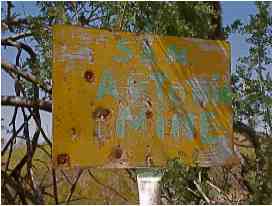 The mine site was cleaned and regraded in the early 2000’s by the Claimant and the Refuge. The remaining structures should not be entered for safety’s sake and the house is strictly off limits. The remaining equipment had residual ownership, or qualified as part of the current claimant’s mining equipment. Collecting is not allowed in any area of the Refuge; please do no pickup minerals, or artifacts. The small hill above the pit is a vantage point to find the landmarks of the vicinity. From its top the Radar station on Childs Mountain can be seen directly North, N. Ajo Peak and Ajo Peak can be found in the Northeast. Kino Peak is framed amongst closer hills and is slightly East of South. Its panorama is worth capturing with your camera. There is also a very nice view of Tepee Butte slightly North of West. To find it look for a single pyramid-shaped hill in the center-ground in that direction. 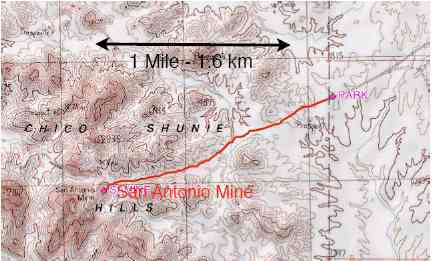 There are numerous small mines in the area found by hiking the nearby hills and abandoned roads. This is a worthwhile area to explore. Be prepared with a good map and compass, a GPS device set to your location before venturing off, and plenty of water during any time of the year.